By Pep Plasin, Head Coach of Girls Area at Academia Sánchez-Casal Barcelona. Someone once said that in life, what really counts are the moments that take your breath away. In the history of our Academy we have had many moments that have left us breathless. These have included many successes, and some failures; moments of knowledge and truth, and story after story of drive and passion. For each of us who are, or have been part of the Academy, these feelings are experienced in very different ways. For me, I don’t focus on what has actually happened during the last 20 years; rather, I focus on why it has happened. Sanchez-Casal has lived 20 years of history, and, in my opinion, the 20 key concepts below hold the secret to our longevity. 1-ADAPTATION / EVOLUTION: Why is adaptation the first concept I talk about? As the world turns steadily, society moves faster and faster, and we as an academy must constantly adapt to change. The rise of the internet and social networking sites, new generations with new means of interacting, and ever younger students entering the Academy every year mean that we too have risen to these new challenges and are constantly changing and evolving with the times. Since the Academy was founded in 1999, there have been many changes in the world such as the emergence of the euro, the boom of mobile phones, the dependence on computers, and the integration of internet into all facets of life. All of these things force us to adapt to the new world in creative and challenging ways. Technology such as video analysis gives us more tools to help our players improve. By recording training sessions, we can visualize technical and tactical questions and rewatch them as often as we like, analyzing them with the player. As a result, they get better at their game and are able to evolve in the sport at a faster pace. 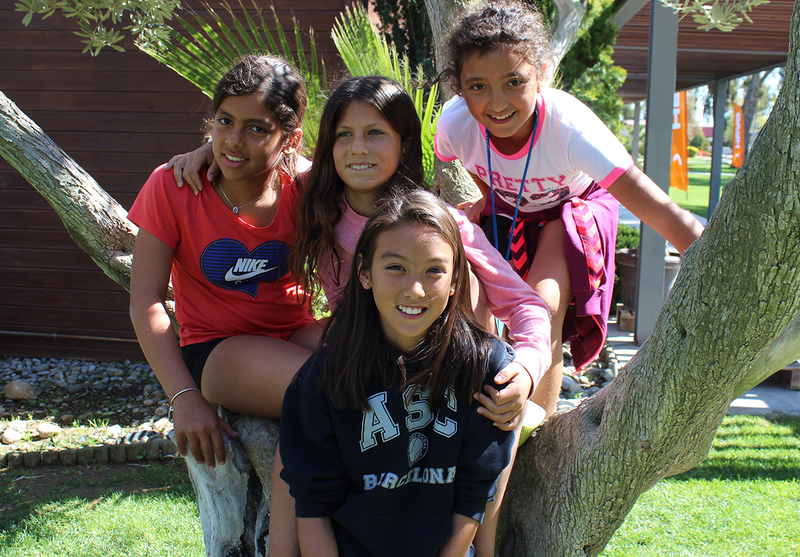 2-THREE CONTINENTS: No other academy can offer the multinational experience that is available at Sanchez-Casal through our Intercontinental Program. Athletes can complete an academic semester in Barcelona, and the next semester move to Naples, Florida with the same plan of studies, curriculum, and tennis training regimen. This is an amazingly enriching experience for the kids that is unique in the world, and those who have participated in the program have described their their experiences as excellent and fulfilling. Another aspect that makes our campus uniquely multicultural is that, throughout the history of the Academy, we have worked with students and players from over 93 different nationalities. Can you imagine how enriching it is for the kids to relate to so many different cultures at such early stages in their lives? 3-FUTURE: Our mission is to provide opportunities in tennis, in education, and in life. It is our raison d’être to provide tools for our athletes to find a successful future, either in the world of professional tennis or by developing their careers at the best American universities, while still playing top-level tennis. Similarly, AS-C offers its employees many opportunities for the future through professional development, allowing for job mobility across the different campuses and continents, and the opportunity to work with players of all ages and abilities. 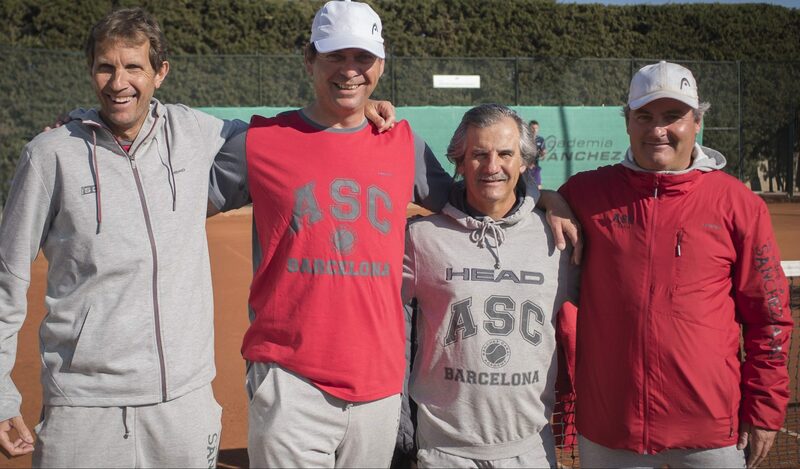 4-PYRAMID: The AS-C Pyramid was created by Emilio Sánchez and Sergio Casal to explain a tennis player’s development through all the stages of their athletic development. A product of their experience as players and trainers, the pyramid details players’ needs, identifying general and specific objectives, and describing the technical, tactical, physical, and mental characteristics of each phase and age. The AS-C Pyramid is the result of work and research conducted over many years, as well as collaboration with all the different areas of the Academy. 5-TEAM: The Academy has an incredible team of people all working towards the same goal: to improve the performance of each player under our guidance. The motor that drives our athletes’ success is the coordination that happens between the different professionals of the Academy as they work together to provide the best conditions possible for each student-athlete to progress. Teamwork makes this goal possible. There are external partners included in the team who also contribute to the constant improvement of our services. From partners like the brand Head, who have sponsored us from the beginning, and with whom we are proud to collaborate, to suppliers who provide their best products and knowledge, and agents, who work to offer our clients programs and experiences that best suit their needs, we are overwhelmed by the level of dedication our team has. We are a multidisciplinary organization that is prepared, experienced, and united for the purpose of positively impacting the development of our student-athletes. 6-SYSTEM: At Academia Sánchez-Casal we have our own training method which we call the AS-C 360 Tennis System. It is one of a kind and is and fully structured to build complete players who are competitive on any surface and in any area of the court. To achieve this, the four pillars that every player must develop are worked on in an integrated manner. These pillars are known as ‘the technical, the tactical, the physical and the mental’. This is how the acronym TETAFIME (TEchnical, TActical, FI-Physical, MEntal) arose. It’s the basis of our training system. 7-MOTOR: We are one of the engines driving Spanish tennis forward, and as a result, we improve tennis worldwide. In our facilities in Barcelona, Naples, and Nanjing, we host many different tournaments, both national and international. These come as an added bonus for the Academy players, but they also benefit the country and the entire tennis world, since competition is one of the most important tools for the development of players of all ages. 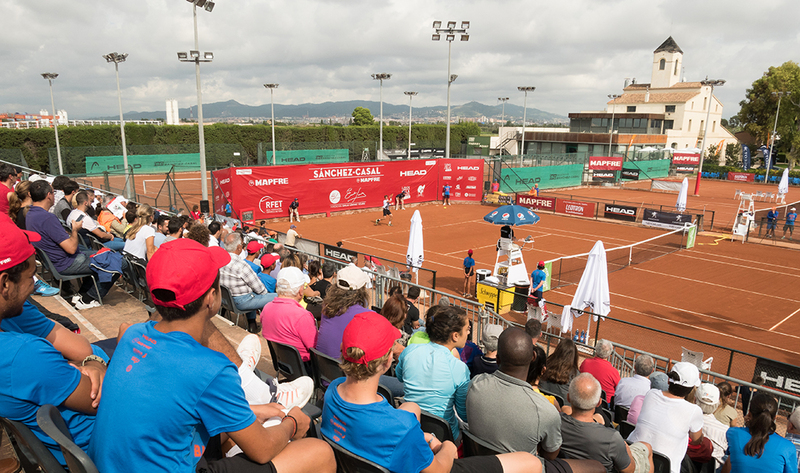 The Barcelona campus is probably the center that hosts more tournaments than any other center in Spain, and we are the only center in Spain to host international tournaments for all age groups, from U10 to U18, to Seniors and ATP level. 8-TRAINING: In order to provide the best education and training to our students, training begins with our own staff. From the beginning, in Sánchez-Casal we have always given great importance to the formation of each department of the Academy. All departments must be at the vanguard of their sector, attentive to new and evolving practices, and striving to continually improve the level of teaching and service we provide our students. Our coaches, teachers, and staff receive ongoing professional development in their respective areas, so that they have all the necessary tools to help the players. 9- DREAMING: The ability to dream has been a key factor in our history. Thanks to dreaming, we have managed to do things that a priori seemed next to impossible. Our dreams have pushed us to be one of the only clubs in the world who organize tournaments corresponding to all the stages of development of the tennis player. Starting with the organization of U10 to U18 tournaments, all of our hard work finally culminated with the creation of the ATP Challenger in 2018, which we baptized “The Tournament of Dreams”. The preparation to host a tournament like this requires a lot of dedication and work from all areas of the Academy, and it all must be achieved without disrupting the usual operations of the campus. Without dreaming and believing in everyone’s ability to successfully do their part, none of this would have been possible. 10-VISION: We are pioneers in many things in the world of tennis, but perhaps the most important is the vision our founders had to devise an Academy which gives all players real opportunities for the future: opportunities in tennis, in education, and in life. What they saw was a tennis academy with its own integrated school within the same campus that shares an ethos and objectives. Our school, ES International School, opens the doors for our athletes to access American universities where they can continue studying and competing at a very high level. Our student-athletes graduate prepared to face the world and succeed in a society that is more competitive than ever. 11 – HUMILITY: This is a very broad term, but in reference to AS-C, we can apply it by saying that all of our coaches, starting with the Head Coaches themselves, work equally with players of all ages and levels. For us, all players are equally important. In our Academy you will see Emilio Sánchez Vicario, Sergio Casal, Ángel Giménez, Stefan Ortega, Pavel Slozil, and many others playing with all levels of players. They do this with the same enthusiasm and dedication as they would if they were working with a professional player. This is a great lesson for all who work at the Academy, that no one is more important than anyone else. 12- HARD WORK: Each and every one of us who work in AS-C is focused on our students and taking care of their needs. We are professionals dedicated to the student’s best interests. From the admissions department, physical fitness coaches, marketing team, administration, and school staff, to the catering crew, physiotherapists, friendly smiles at the reception desk, and custodial technicians, each and every employee knows how important their daily work is to providing the best service for our student-athletes. 13- COMMITMENT: We have a very solid and faithful employee base, and most of us have been working for AS-C for quite a long time. We are people who have made the Academy into our second home and treat our work like a very personal project. We are 100% committed to the mission of the Academy and to our players. We are a family. 14- CONSISTENCY: Tennis is a sport of repetitions, and perseverance is a basic quality required from all tennis players if they want to improve. The coaches know this and lead by their own example. The coach is the first to be consistent, not get discouraged, and to turn mistakes into learning opportunities for improvement. 15- FIDELITY: Many of the staff at the Academy have been working here many, many years and have built a deep relationship with each other. The greatest example of this is our own founders, Emilio Sánchez and Sergio Casal, whose common history began when they played doubles and traveled around the world together. These kinds of relationships are very difficult to find in today’s world. We are talking about relationships that have lasted over 35 years, and about coaches that were themselves AS-C students-athletes, who now are important pillars at the Academy. They have embodied the philosophy of the Academy in their own lives and I think this makes a huge difference when comparing AS-C to other academies. Such fidelity is rare. 16 – OVERCOMING ADVERSITY: In 20 years of history, the Academy has achieved great feats, but has also suffered some difficult blows. Adversity has visited us, but has not managed to conquer us, and we have always taken something positive away from difficult situations. Sadly, a student at the Barcelona Academy, passed away tragically in 2010, and he became a positive lesson for the rest of our student-athletes and how they respect life. Antonio Hernández was the Academy director, and he passed away in 2014. Antonio was a guide for players and coaches alike, and as a leader, he was almost impossible to replace. His charisma made him the coach par excellence. After his death, the team came together with a renewed force, with the goal of honoring Antonio’s legacy through hard work and dedication. Antonio will always be a fundamental figure in our history. In 2017, adversity hit again, taking Cásper Fernández after his battle with cancer. Casper was a student-athlete from our academy in Florida. He showed us how to fight to the end and never give up. We have created a great project in his honor, the Cásper Tour, which is an international tennis circuit for kids from 8 to 14 years old that raises money for charity. This is the most recent project of the Emilio Sánchez Vicario Foundation and it has been a great inspiration. One of the greatest lessons we can learn from tennis is overcoming adversity; indeed, it is one of the greatest lessons of our lives. 17 – EFFORT: The long journey the Academy has taken to reach the position it has today has not been easy. The effort of everyone who has participated in its development has been arduous and necessary. From Emilio and Sergio down to the latest new hire, all have added their grain of salt to help the Academy become what it is today. But they are not the only ones who have to make a great effort. Effort is the first value that our young tennis players need to acquire, because without effort, progress is impossible. Our student-athletes’ families are a clear example of how much effort is required, as they continuously support their children in this great objective. 18 -RESPECT: Respect is the other great teaching moment in tennis. Our founders, Emilio and Sergio, have great respect for the sport that made them what they are today. Respect for tennis is the main reason why, after a successful professional career, they work every day from the front lines with young people trying to achieve their dreams in this game. This is the ultimate form of respect for the sport: giving back to tennis much more than tennis has given them. As a result, respect is one of the main values that we try to instill in our student-athletes. We show respect for our rivals, for our families, for our coaches, and for the facilities on our campus. We teach them that respect is something that they themselves must earn from others with their attitude, with their values, and by their example. Respect is not something that is given, it is something that is earned. 19- DISCIPLINE: Discipline is sometimes a scarce resource in today’s society, but in the Academy we encourage a positive attitude towards discipline with our students. Discipline, hard work, and tenacity will make your talent explode. Without discipline, it is not possible to achieve greatness, and it is not possible to achieve ambitious goals, even if you are naturally talented. Talent must be cultivated, developed, and promoted. Discipline is the way to make it shine. 20 -PASSION: Finally, the concept that culminates our formula for success is passion. Great goals can only be achieved with passion. I believe that passion has led many of us to achieve much greater things at ASC than we would have initially imagined possible. Our profession is often one of personal sacrifice, that requires sensitivity in the face of complex situations. Without passion, it is not possible to achieve that balance. Passion doesn’t only infuse everything we do in tennis, but also it is essential for teaching in general. It is necessary to be passionate to be able to meet the needs of our student-athletes every day. Passion is an invincible weapon with which to achieve all your goals in life. If you take on tasks with passion, it will compensate for all your shortcomings. Passion is the secret of long life, and the magic ingredient for the 20 years of success of the Sánchez-Casal Academy and that passion will accompany us during the years of success that await us. 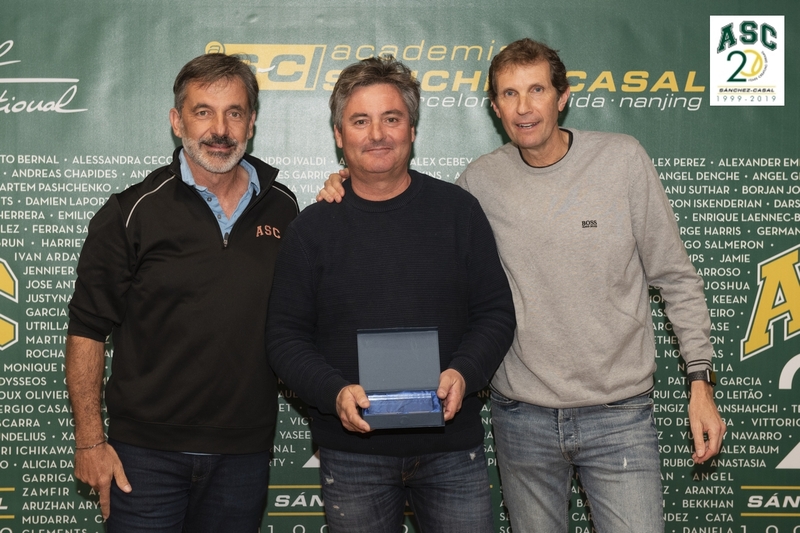 This entry was posted in Tennis and tagged coach, Emilio Sanchez, Leadership, Sánchez-Casal Academy, Sánchez-Casal stories, Spanish Tennis, Tennis, tennis academy, tennis legends. Bookmark the permalink.